Bats are an integral part of a healthy ecosystem, but having them in your home is never something you want. Their presence poses a health risk to you and your family and puts the wellbeing of your home in danger. If you’ve found bats in your home, getting them out quickly should be a top priority. 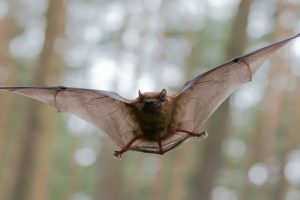 Critter Control® of Miami has the knowledge and skills necessary to get the job done right.Our expert animal removal technicians are eager to create a plan to remove your nuisance bats that works for your specific needs. We utilize cutting-edge tools and techniques like live-trapping or one-way doors to not only remove the bats quickly, but to protect them from harm as well. Bats are protected by law in most areas, making it illegal to harm or kill them. It is for that reason that we always recommend enlisting the help of a professional when you’re faced with a bat problem. At Critter Control® of Miami, we warranty our comprehensive removal services with a three-year quality guarantee. Our A+ rating with the Better Business Bureau and Angie’s List Super Service Award are a testament to our dedication to quality. If you’ve found bats in your home, contact us today at 305-964-8683 to schedule your complimentary consultation.